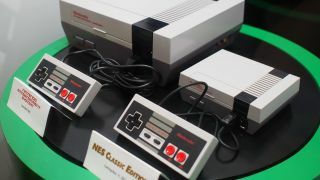 By now you know that Nintendo is bringing back the NES in miniature form, but we hadn't seen it in the flesh – plastic? – until today. The Nintendo Entertainment System: NES Classic Edition made the trip to San Diego Comic-Con, and we caught the little thing sitting right next to its bigger, older brother in the Nintendo Lounge. While we couldn't get up close and personal with the mini NES, the side-by-side comparison gives us a good idea of just how small it is compared to the original. Nintendo did an excellent job of taking the 1985 NES' design and shrinking it down without compromising detail. It almost looks like you could sprinkle a few drops of water on the NES Classic Edition, and it would expand to full size, like one of those dollar-store dinosaur sponges. While the resemblance is uncanny, the mini NES isn't as fully featured as the original. Its cartridge lip doesn't open, for one, and it will only play the 30 retro games it comes with as Nintendo doesn't plan on releasing any more. You won't be able to access more games via the internet or external storage device, either. The NES Classic Edition goes on sale November 11 for $59.99 and AU$99.95 (around £45). It comes with a controller (how awesome does it look? ), though additional ones will be sold separately. The Wii's Classic Controller Pro is also compatible with the system. After seeing the NES Classic Edition in person, we have to say we're even more excited for its release. It's just like our childhood ... in miniature.